We had a great morning with Eoin Bradley,past pupil who visited our school today with the Tennent’s Irish Cup. The Irish Cup is the fourth oldest National Cup competition in the world and was first contested in 1881. Eoin was instrumental in Coleraine winning the Cup. We also had the pleasure of meeting Coleraine’s manager Oran Kearney last year. 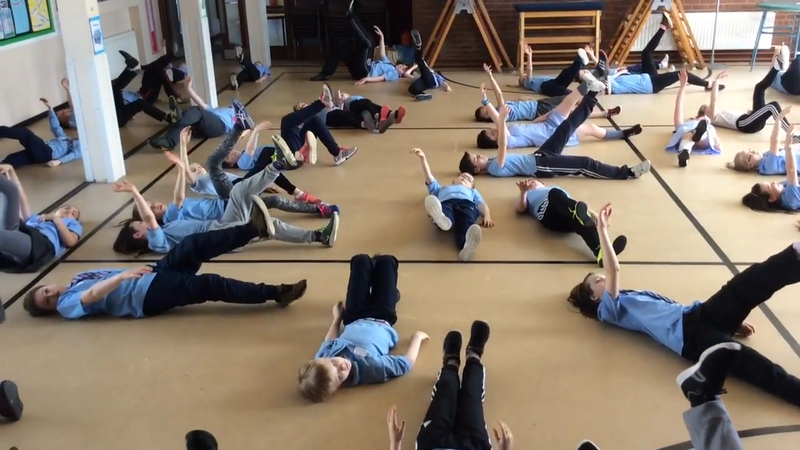 We had a fabulous Creative Dance/Movement session with our Pushkin facilitator Libby Mailey on our theme of ‘Opening Ground’. 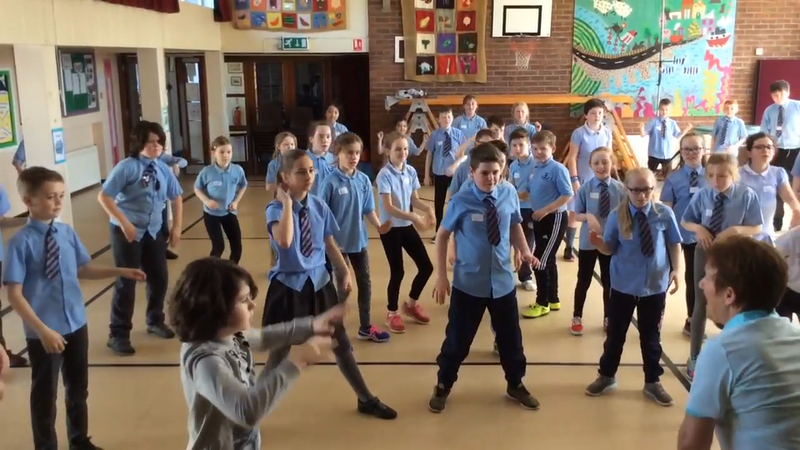 Our pupils explored the theme through dance. This morning’s workshop incorporated so many aspects of the currriculum and of our Shared Education values. Pupils are cementing friendships through our Shared Education Programme which is developing our children in so many ways and giving them new opportunities to develop their talents. Our St.Columba’s Spelling Bee Finalists!!! Tony helped us to learn about our Irish Culture. Yoyo and Jackie tell us about their customs, traditions and how they celebrate Chinese New Year. 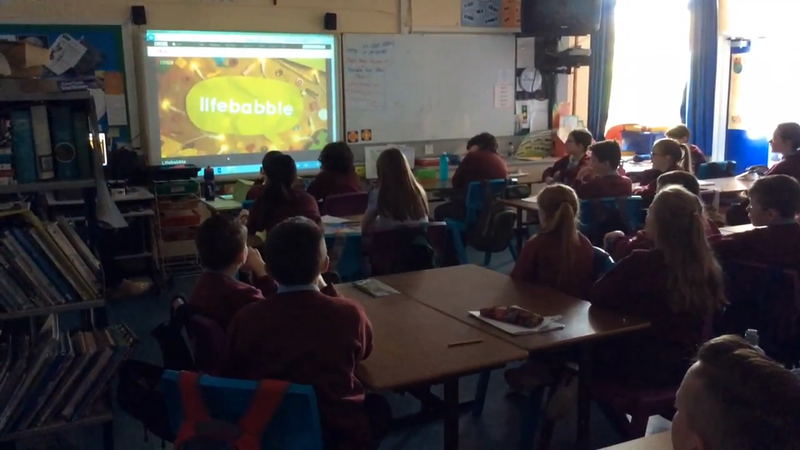 Cancer Focus ‘Smoke-busters’Presentation alerted Year 6/7 to the dangers of smoking. This presentation is part of our PDMU Programme. All pupils from Nursery to Year 7 took part in the Cancer Focus Event appropriate to their age and stage of development. To celebrate St. Brigid's Day we made St. Brigid crosses. Getting creative during our 'STEAM' lessons. Christmas Dinner Investigation - We had to stay within our budget !! Year 6/7 thoroughly enjoyed their trip to the Millennium Forum to see Jack & the Beanstalk. John McCarron visited KS2 to explain the work of Trocaire from a Global point of view . On Thursday morning Year 6 visited Kilrea library, thank you to the staff at the library for such an interesting visit. P6 pupils enjoyed helping their P1 Buddies with their Play Activities this morning. 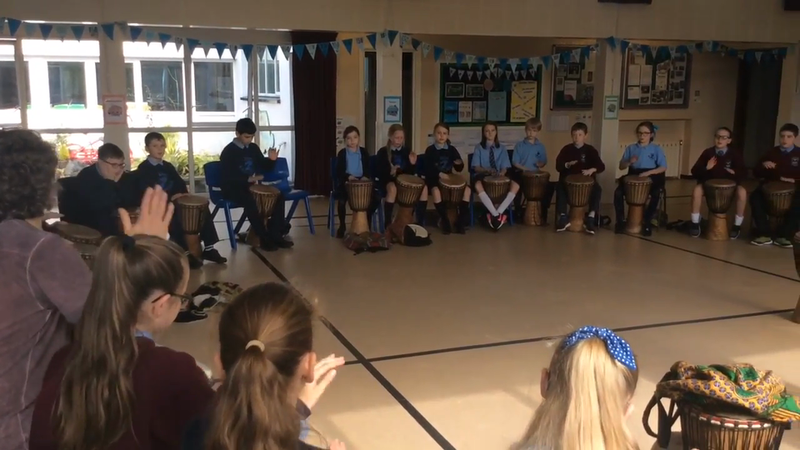 P7 pupils enjoyed a morning of "drumming"with their friends from Kilrea Primary School. They learned to play some African pieces. Big congratulations to Ana for raising so much money for a great cause. Well done Ana! We celebrated International Literacy Day by designing book covers. Reading is integral to our learning and we celebrate the privilege of a great education in St.Columba's Primary School. As part of our Global Learning experiences we realise that not all children are so fortunate in our world.